For many, Voivod have been dwindling to a gradual end for several years now, and with good reason - the death of guitarist Piggy in 2005 had most convinced that the band simply could not continue without him. It's certainly a tribute to Piggy's skills that the two albums released since then featured riffs that he had recorded prior to his death, and made for actually pretty damn good Voivod albums. So for many fans, one question has burned at the back of our minds for years - what happens when the well runs dry, as it inevitably must? What happens when the riffs run out? We fans (Brain Scan has been my phone ringtone for years) simply couldn't accept an end to the legend, yet how could Voivod continue without Piggy? Unthinkable, right? Well, a glimpse as to the future came with Voivod's rather good 2011 live album Warriors On Ice, the band having played some tours with 'Chewy' (Dan Mongrain of Martyr, Gorguts, Quo Vadis, etc). You honestly couldn't tell that it wasn't Piggy playing, Chewy such a fan and student of the great guitarist that he slotted perfectly into the band. 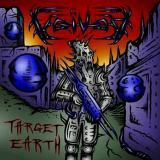 And so it proves with new material from the band, Target Earth a step back in time to the classic Voivod eta of Dimension Hatröss and Nothingface. Yes, it's that good, a strange, bendy fusion of progressive and thrash metal that isn't afraid to be obnoxiously impenetrable, catchy or both at once. It would be easy to ignore the return of original bassist Blacky (last seen on the band's controversial 1991 album Angel Rat) were it not for those organic, pulsing basslines, heavy and dangerously lurking beneath the cutting guitar. Add in the typically brilliant vocal sneers and underappreciated drumming of Snake and Away respectively and you have Voivod in a nutshell. From the opening fuzz of the title track, reminiscent of the eerie opening of Killing Technology, like a distant spaceship searching for a signal, you suspect you're in for a treat, and the huge bass rumble that follows confirms it. Chewy's guitar is a cascading roar, moving from thrashy chug to eerie progressive wave from second to second. It sounds so natural that your mind doesn't question it at all, and the songs flow perfectly by, as essentially Voivod as any of the band's past releases if not more so. Don't be under the assumption that the band are playing it safe, however, for Voivod being themselves means pushing the boundaries, and examples of this are everywhere. Take the punky thrash of Kluskap O'Kom, beginning with breathy pants (Inuit throat singing, apparently) and leading on to a razor-sharp pounder complete with gang shouts, twisting and turning joyfully. The acoustic plucks that open Empathy For The Enemy are new, but brilliant, contrasting well with the song which is soft and melodic in that woozy post-Floyd way, turning nasty with heavier riffs along the way. First single Mechanical Mind hits a perfect rhythm immediately, like something from Nothingface brought up to date, complete with wonderfully catchy 'na-na-na'ing over tribal drum patterns and some perfect superstar metal soloing, immediately subverted by a pulverising line of those bending riffs that we know and love. The initial slow meander of Warchaic, meanwhile, slowly builds into a driving, intense rumble that almost shocks when it ends - fortunately, the gleefully noisy Resistence is soon along to shock you back into life with its grooving thrash, slowing at the end for some spookily atmospheric proggery. It's worth noting that the songs are nice and lengthy, with four six-minute and two seven-minute tracks - Voivod are as comfortable with themselves in 2013 as we are. That really sums up this album, for when a band sounds like it knows what it is doing and is enjoying itself doing it then you're assured of an excellent listen, and Target Earth is that in spades. The snakily experimental Kaleidos alone shows that this band has years of life in it yet, mixing past and future in a skilful macrosolution that shows just what the band can do, while thrashheads will be dancing along in glee to the breakneck pace of Corps Étranger, sung in French. Finale Defiance fades out after just a minute and a half, the statement from the band clear - defiantly alive, continuing into the future with much unwritten yet much to come. Anyone who wrote Voivod off was mistaken, and even Piggy himself would be proud of what the band has produced here, an excellent album that's a tribute to their heritage as well as a continuation of it. Voivod is dead; long live Voivod.